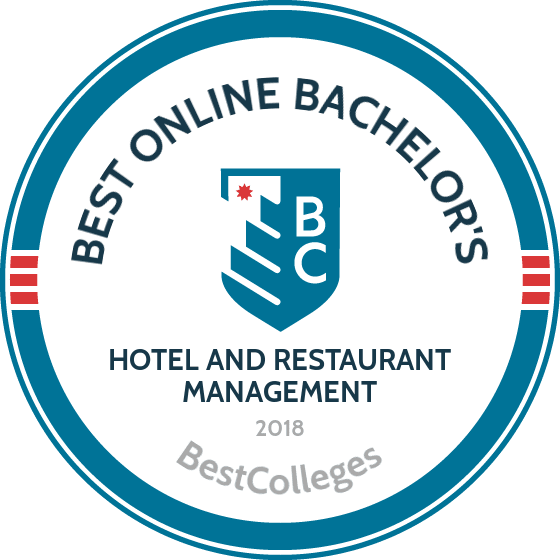 What Are The Best Online Bachelor's in Hotel and Restaurant Management Programs? What Else Can I Expect From a Bachelor's in Hotel and Restaurant Management Program? Hospitality managers create memorable experiences at hotels, restaurants, and other establishments that host guests. They work in a variety of settings, including ski lodges, beach-side hotels, exclusive country clubs, and upscale restaurants. As tourism expands in the U.S. and more people visit restaurants, jobs in hospitality will continue to grow. The U.S. Bureau of Labor Statistics projects a 4% increase in positions for lodging managers and an 11% increase in jobs for meeting, convention, and event planners between 2016 and 2026. By pursuing a bachelor's degree in hotel and restaurant management, you can cultivate the knowledge, skills, and hands-on experience for a career in the food and tourism industry. Students in a hotel management bachelor's program build interpersonal communication skills and business knowledge that allow them to serve the needs of customers and clients. Common course topics include financial accounting, strategic management, human resources, marketing principles, and hospitality services operations. After completing coursework in fundamental theories and best practices, students can take advanced classes, usually in an area of concentration. Online bachelor's degree in hotel and restaurant management programs often offer subfields in marketing, office management, and special event planning. Hospitality businesses become successful by making individual people happy. Since these customer service skills are vital, practical work experience stands as a crucial part of the best online bachelor's degree in hotel and restaurant management programs. You should expect a capstone requirement, usually in the form of an internship. Depending on the program, you may be able to complete an internship where you live or at your current place of employment. Some schools offer summer placement options with their business partners. At FIU, students need not attend courses on the Miami campus to receive a world-class education. The university boasts more than two dozen online undergraduate degree programs, including the fully online bachelor of science in hospitality management with a concentration in culinary management. The 120-credit curriculum includes courses in restaurant management, lodging operations control, and commercial food production. Concentration classes include international cuisine, culinary innovation and entrepreneurship, and culinary event management. Alternately, students may choose a concentration in beverage management or restaurant and foodservice management. Students have the opportunity to participate in the prestigious South Beach Wine and Food Festival. All learners also participate in an advanced 300-hour internship for hospitality and tourism. The program concludes with a senior seminar, in which students research problems in the hospitality industry and propose solutions. Applicants applying as freshman must submit ACT or SAT scores in addition to their high school transcripts. FIU considers transfer credit on a case-by-case basis. Once accepted, in-state students save approximately 33% on tuition compared to out-of-state students. Bama by Distance boasts dozens of online programs for students unable to study on the Tuscaloosa campus. In the fully online bachelor of science in hospitality management program, students prepare for careers in food service management, hotel management, catering, convention sales, and tourism. Students pursuing the hotel management bachelor's degree online take courses in hospitality marketing, front office procedures, hospitality law, food safety, and quality food production. All students complete a 500-hour internship. Full-time students can complete the 120-credit degree in four years. UA accepts applicants on a rolling basis. Transcripts from recent high school graduates must reflect a minimum 3.0 GPA. Applicants who graduated high school more than four years before applying do not need to submit standardized test scores. UA accepts transfer credits. The school offers 10 scholarship and grant opportunities exclusive to online students. Out-of-state distance learners pay the same rate as in-state students. In addition to courses taught on its Providence, Rhode Island, campus, Johnson & Wales offers multiple online degree programs. The fully online bachelor of science in restaurant, food, and beverage management program combines coursework in hospitality management and food service. Graduates earn certifications in alcohol service and national sanitization. The 120-credit bachelor's degree in hotel and restaurant management features coursework in front of the house operations management, beverage appreciation, social media marketing, and hotel food and beverage operations control. Students in this program may choose to minor in human resource management. All courses last 11 weeks. Freshmen applicants must submit high school transcripts. Johnson & Wales does not require applicants to submit standardized test scores. Once accepted, all students pay the same tuition rate. New students can start the program at four points throughout the year. The university provides special tuition assistance to active military personnel and veterans. Northern Arizona University’s School of Hotel and Restaurant Management has offered a bachelor’s degree in hotel and restaurant management for over 30 years. The program has been recognized by the Accreditation Commission For Programs In Hospitality Administration, a distinction held by less than 20% of all hospitality programs. Students have the option to study completely online or in a hybrid format at the Phoenix or Tucson campus. The bachelor's degree in hotel and restaurant management requires 1,200 hours of work in the hospitality industry. Graduates go on to work at restaurants, hotels, resorts, country clubs, and casinos. Freshman applicants must submit either SAT or ACT scores in addition to their high school transcripts. Students may transfer up to 75 credits from an accredited Arizona community college. The university reviews other transfer credits on a case-by-case basis. All distance learners pay the same tuition rate. Military veterans receive specialized student support services to help them transition back to civilian life. At Newbury, students can take advantage of one of two online degree programs. The online bachelor of science in hospitality management with a concentration in hotel and restaurant management focuses on emerging trends in the hospitality industry. Students prepare for careers as hotel managers, event planners, and restaurateurs. Full-time transfer students can complete the program in just 22 months. The 120-credit bachelor's degree in restaurant management covers topics in strategic management and principles of marketing. All courses last 10 weeks. Students benefit from a low student-to-teacher ratio. A semester-long internship gives students the opportunity to gain experience in the specific industry that interests them. Newbury requires SAT or ACT scores from applicants applying as freshmen. Transfer students may apply up to 75 credits towards a bachelor's program. Students' work experience may satisfy some graduation requirements. Out-of-state students pay the same tuition as Massachusetts residents. Distance learners are eligible for merit and need-based scholarships. Each online bachelor's degree in hotel and restaurant management varies slightly based on specific coursework and the school's teaching philosophy. For example, you might find more electives in a program grounded in the liberal arts, or an intensive capstone requirement at a career-oriented school. Even in a two-year program, students can customize their education through electives and concentration options. Students pursuing a bachelor's degree in restaurant management usually take the same foundational business courses regardless of the school they attend. However, programs vary based on departmental focus and faculty expertise. Do your research carefully. Don't be shy when talking to the admission counselors at your prospective colleges or universities to ensure that the program you enroll in fits all of your academic and professional needs. Below are some common courses available in most bachelor's degrees in hotel and restaurant management. Food and Beverage Operations: This class provides an overview of how to run food and beverage venues, including bars, restaurants, hotels, and catering services. Topics include sanitation, purchasing, menu creation, staff training, and liability concerns. Coursework often involves case studies and group work in the form of a project or presentation. Strategic Management: Another course which emphasizes collaborative learning, this class teaches students how to design, actualize, and analyze business initiatives. Students learn how to create strategies that promote efficiency and growth within an organization. The class usually culminates in original research or a project. Students also examine real-world scenarios using such tools as SWOT analysis. Conference, Meeting, and Event Planning: This course prepares students for careers as event planners, conference coordinators, and office managers. Topics include destination selection, venue management, travel arrangements, lodging, safety, and food service preparation. Depending on the nature of the program, the course may also cover seminar design and activities planning. Management Accounting Principles: Many of a hospitality manager's duties involve careful fiscal planning. This class teaches students to manage money in a way that promotes growth while minimizing costs. Organizational Behavior for Hotels and Restaurants: Human resources is a fundamental part of earning a restaurant and hotel management bachelor's degree online. This class trains students in the methodologies and techniques of team recruiting, training, organization, and reward. Workplace diversity is another common topic in the course and helps students cultivate a collaborative, innovative, and safe environment. How Long Does it Take to get an Online Bachelor's in Hotel and Restaurant Management? Similar to other baccalaureate programs, bachelor's degrees in hotel and restaurant management usually require students to complete 120 credits over the course of four years. More comprehensive programs, such as dual degree pathways, may take five or six years. Students who want to graduate quickly should examine schools that offer accelerated courses and summer sessions, which provide scheduling flexibility and enable you to take more courses each year. Additionally, an internship or practicum requirement may affect the length of a program, particularly if you need to travel to a specific location to complete it. The structure of your online restaurant and hotel management bachelor's degree also influences your graduation date. Most remote courses are taught asynchronously. However, a school may require you to take classes in a cohort, where you and a small group of peers progress through the program together, usually by taking one class at a time. While this is advantageous in some circumstances, it doesn't allow for the same level of flexibility as individually paced learning. For colleges and universities to confer degrees recognized by employers, the government, and professional organizations, they must be accredited at the national or regional level. National accreditation means that schools have received recognition from an accrediting agency under the U.S. Department of Education (ED) or the Council for Higher Education Accreditation (CHEA). National accreditation ensures that schools meet certain academic and professional standards. Regional accreditation is considered more prestigious and difficult to obtain than national accreditation. Schools receive regional accreditation from one of six organizations, depending on where they're located. You should also consider program-specific forms of accreditation granted by organizations such as the Accrediting Commission for Programs in Hospitality Administration or the Association for the Advancement of Collegiate Schools of Business. As a government organization, the ED takes charge of a school's federal funding, including many loans and awards like the Pell Grant. The ED also ensures that the college or university follows national education mandates. Established in 1996, CHEA is a private nonprofit organization dedicated to ensuring the academic integrity of the more than 3,000 colleges and universities under its umbrella. CHEA also provides funding for research and advocates for the rights of its members. For more information on nationally accredited schools, go to the ED and CHEA websites. The table below aggregates salary information for careers in hotel and restaurant management. In all positions, salaries grow over time as employees gain more experience. Hospitality managers cultivate expertise primarily by working with their teams and interacting with customers, so it's not surprising that more seasoned professionals enjoy a bigger paycheck. As with other industries, place of employment affects pay. A general manager of a hotel chain can earn more than one who manages a small bed-and-breakfast. Your level of education will also affect your salary. Hospitality managers personify business, leadership, and customer service expertise. They are people pleasers who understand the inner workings of financial planning, social media, and other marketing strategies. Hospitality managers also know how to motivate and coordinate their employees. These core qualities and skills enable marketing professionals to work in a variety organizations, including hotels, restaurants, and businesses such as resorts and cruise companies. Below are five of the most popular careers in the field along with their duties and requirements. These professionals organize special events, including weddings, school reunions, industry conventions, and academic conferences. They inspect locations, plan for lodging, organize staff, design food and beverage menus, and perform other duties that ensure guests have a safe and enjoyable experience. Most hold at least a bachelor's degree. Working for hotels, resorts, and similar companies, lodging managers make sure customer experience meets organizational standards. They oversee diverse tasks such as room inspection, guest services coordination, and financial and strategic planning. As with most other managerial positions, these professionals usually hold a bachelor's degree. These managers lead the daily operations of restaurants and other businesses that serve food and beverages. They train and organize staff, order supplies, ensure the business meets sanitation and customer service standards, and handle guest needs directly. While experience stands as a key component for career advancement, food service managers must hold professional credentials, including industry certification. Many also hold an academic degree at the associate or bachelor's level. These skilled professionals design, implement, and direct advertising campaigns and other promotional initiatives. Their job is to generate interest in a business or organization, thereby driving growth. Marketing managers hold at least a bachelor's degree, but most pursue a graduate degree to gain additional business and leadership skills. As a main driving force behind business operations, sales managers organize teams, analyze and project statistics, and implement campaigns and strategies. Their job is to boost profitability and expand the client base. These highly skilled professionals possess at least a bachelor's degree. However, a master's degree is common for this career because it provides the advanced business and financial skills necessary for success at higher levels. Hotel and restaurant managers, especially those early in their careers, can benefit from membership in professional organizations. Many of these organizations provide additional training and certification programs that can give you an edge during job applications. Professional organizations also support their members through conferencing and networking events, as well as funding opportunities such as academic scholarships. Hospitality management organizations often administer job boards, digital libraries, webinars, and discussion forums. As the largest professional organization for the hotel industry in the United States, AHLA advocates for advantageous policies and standardization within the field. The organization also provides training programs, extensive research and literature, and networking opportunities. ICHRIE connects hospitality professionals all over the world through digital communication efforts and in-person events. Members also benefit from funding opportunities, training and professional development programs, and a job board. Founded in 1919, the NRA represents more than 380,000 restaurants in the U.S. The organization supports members through lobbying, research, and funding. The association also provides training, education, and career development opportunities. Dedicated to the sustainable growth of hotels and related businesses worldwide, HSMAI promotes research and provides an extensive digital library of literature, statistics, and best practices. Members also benefit from the association's career center, professional training programs, and awards. JBF promotes diversity, sustainability, and growth in the restaurant and bar industry. Members enjoy professional training through impact programs, as well as networking opportunities through chef tours and national conferences. The foundation also provides scholarships and grants. Like any program, a bachelor's degree in hotel and restaurant management often requires significant financial investment. You should prioritize minimizing overall costs, ideally to the point of zero student loan debt. The Free Application for Federal Student Aid (FAFSA) enables you to sign up for multiple scholarships and grants simultaneously. You should also perform extensive searches for funding opportunities offered by national organizations such as Tourism Cares or the James Beard Foundation, as well as regional bodies like the Colorado Restaurant Association.